It's hard to explain, to people that aren't from the St. Paul/Minneapolis area, how my favorite soup comes from a grocery store! Byerly's was always that higher end grocery store that had foods that were just a step above the rest. Of course, they had all the normal foods as well, but they had the super yummy ones that you just craved. Waaaayyy back in the day, when my friend Stacey and I had our first apartment, we were in walking distance to Byerly's so we were fortunate enough to do a lot of shopping there. In more recent years, I would love stopping there on my way home from work and picking up special meats for grilling. Now, it is just a treat to stop at when I am in the cities, and get their pasta sauces, bakery treats, soups.... this list goes on, but you get the idea. I guess they don't go by the same name anymore, I think they were bought out by the store from the other side of town. I believe their name is Lunds now. Ahhhh.... the memories! One of the best soups found at Byerlys', locally famous, is their Wild Rice Soup. You could order it in their restaurant or purchase several different size containers in the store. I would always try to have a container on stand by. Feel a cold coming on? 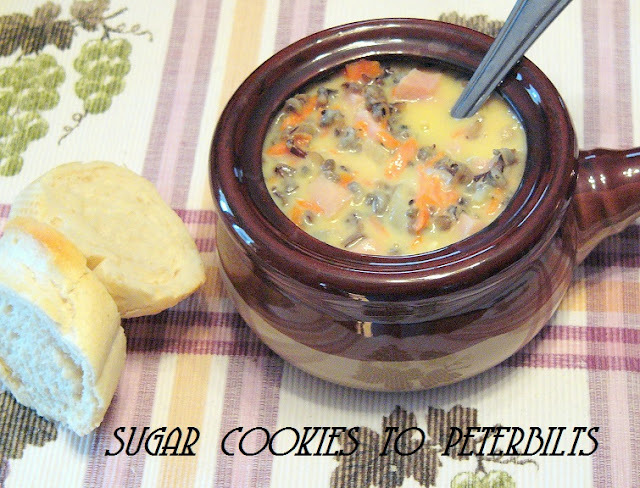 Wild Rice Soup. Bad day at work? Wild Rice Soup. Raining out? Wild Rice Soup. See how I am? I got even more spoiled the year that my mom bought the Byerly's cookbook. Oh, life was good! Mom would always make a big batch so she had enough to share with me. She still makes it often, and she usually serves it for Christmas Eve when we celebrate at their house. When making this, you can use Half and Half in place of the milk for the most indulgent version of this recipe. Just to lighten it up a bit, I use milk. In saucepan, melt butter; add onion and saute till tender. Blend in flour; Cook for two minutes. Gradually add broth. Cook, stirring constantly until mixture comes to boil. Boil while stirring, for 1 minute. Stir in rice, carrots, ham, almonds, and salt. Simmer 5 minutes. Blend in milk. Heat thoroughly.